Palestinians in Washington DC to hold Feb 28 protest telling PA: "You're fired!" Notice of termination served on February 28, 2011 4:00-6:00 p.m.
at the General Delegation of the PLO Mission to the U.S.
1320 18th Street, NW - Washington, D.C. I was asked for some resources about the Palestine Papers, which were released by Al Jazeera on 23 January. These 1600 documents, dated from 1999 to 2010, including minutes, reports, emails, maps and presentations, constitute the largest leak and the deepest insight into the failed "peace process" ever. I was one of several experts and analysts invited by Al Jazeera to take an early look at the documents and I wrote at least eight articles about them which are linked below. I've also included some key articles by other writers and links to the document archive itself. Scholars, historians and activists should take it onwards from here because there is still much exploring to be done of these valuable documents. "Jordan, PLO clash on refugee issue"
"A dangerous shift on 1967 lines"
"PA lobbying blocked Shalit swap"
"The US role as Israel's enabler"
"If US can't be 'honest broker' in Middle East, get out of the way"
"PA relinquished right of return"
"Dayton's mission: A reader's guide"
"Shlomo Ben Ami, former Israeli Forign Minister, Daud Abdullah, director of Middle east monitor UK and Ali Abunimah, co-founder of Electronic Intifada make up the panel of analysts who discuss the Palestine Papers. This is Part three"
Short video clips of protest in downtown Amman, Jordan, 28 January 2011. Parties represented included Islamist and Leftist parties. Slogans included calls for resignation of the government of Samir Rifai; Free elections based on a fair election law; end to corruption and privatization; economic justice; cancelation of the peace treaty with Israel; an end to the withdrawal for citizenships from Jordanian citizens of Palestinian origin. Many slogans in solidarity with protests in Egypt today. Protest which began after Friday prayers at Al-Husseini mosque lasted about two hours and ended peacefully. 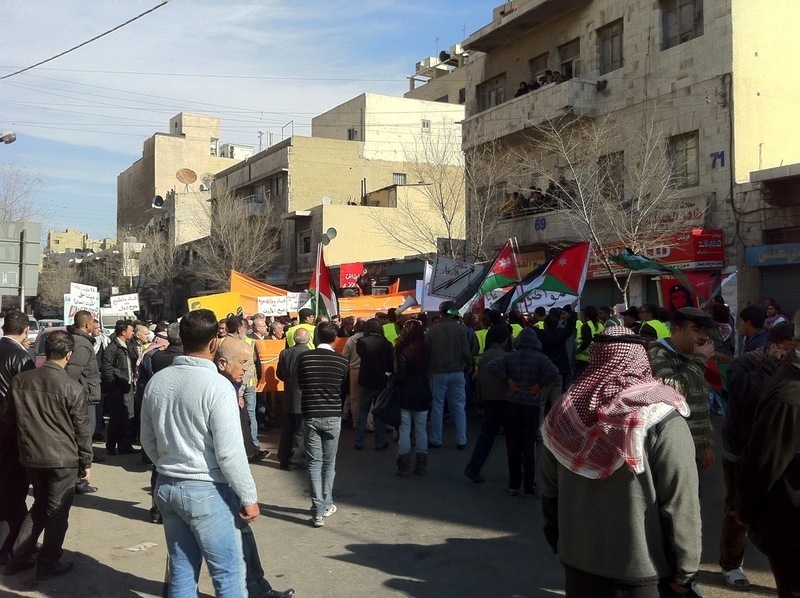 Protests have now occurred on four successive Fridays in Amman and other parts of Jordan. Protest in downtown Amman, Jordan, 28 January 2011. Parties represented included Islamist and Leftist parties. Slogans included calls for resignation of the government of Samir Rifai; Free elections based on a fair election law; end to corruption and privatization; economic justice; cancelation of the peace treaty with Israel; an end to the withdrawal for citizenships from Jordanian citizens of Palestinian origin. Many slogans in solidarity with protests in Egypt today. Protest which began after Friday prayers at Al-Husseini mosque lasted about two hours and ended peacefully. Protests have now occurred on four successive Fridays in Amman and other parts of Jordan. Announcing a sit-in at the Palestinian Embassy, London, UK, in the name of the General Union of Palestine Students, and as part of a campaign for Palestinian national representation, calling for the holding of direct elections to the Palestine National Council. More details are attached in our English and Arabic press releases. We are currently talking with the ambassador. 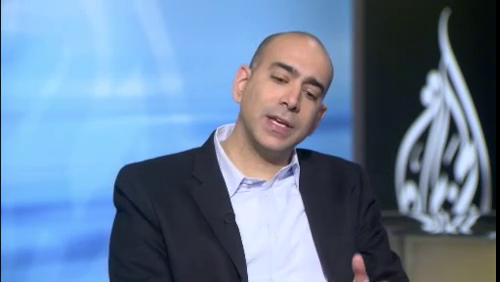 I was interviewed by David Foster on Al Jazeera English on 25 January 2011 on the revelations that the Palestinian Authority had conceded the right of return for Palestinian refugees to Israel. Just received this really charming email signed "your Israeli friend"
When did butcher Ehud Barak cease to be VP of the Socialist International? As recently as January 5, Israeli defense minister and Gaza war criminal Ehud Barak was listed as Vice President of the Socialist International, bringing that organization into eternal disrepute and irrelevance. On January 17, Barak announced he was breaking away from Israel's ostensibly "socialist" Labor Party and forming his own "Centrist, democratic and Zionist" party called Atzmaut ("Independence"). 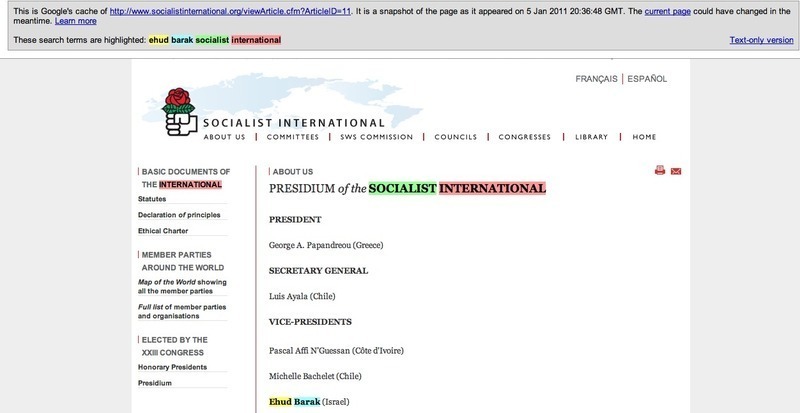 Well Barak is no longer listed as a VP of the Socialist International as the pictures show. When did they have time to remove him? Palestinians have already given up so much since 1948. It's up to Israel to end its campaign of ethnic cleansing for the peace process to move forward.